Gain control over your body, learn fun new skills, and get in the best shape of your life -- no matter who you are or where you're starting from! The fun, easy-to-follow bodyweight training system that will show you how to gain complete control over your body, look like a gymnast and perform like a Jedi -- in your home or at the gym. A few years back, I was mindlessly surfing down a rabbit hole on YouTube (you know those video binges I’m talking about), when a video stopped me in my tracks. A seemingly normal guy named Jim Bathurst was doing all sorts of crazy training exercises using only his bodyweight. I was amazed and in awe of his strength, control, and ability to move his body in a seemingly effortless way. It turns out that Jim wasn’t a genetic superhuman, and there weren’t any big time secrets to this style of training. Instead, he was self-taught, and simply started where we ALL start: with with basic moves that build on top of one another, step-by-step, consistently and patiently, until he was able to do things that left my jaw on the ground. In other words, Jim wasn’t already a superhero who then went out and started training in this way. Training like this TURNED HIM INTO a superhero. I reached out to Jim – and to my surprise – he answered. He encouraged me to start training with new movements like handstands and convinced me to start training basic exercises with gymnastic rings. I’m not going to tell you it was easy. In fact, I sucked early on. I had an overwhelming fear of looking foolish while trying these new movements, and I felt awkward being the ‘weird one’ in my gym, hanging up my rings in a commercial gym while everybody around me did bicep curls and bench presses. With each passing day, I got a little bit stronger. The exercises got more and more fun. I surprised myself when I looked in the mirror one day and realized I had started to transform. I had gotten stronger, and my body started to take the shape of someone who trained like a gymnast. These days, I am strong in a way that goes far beyond any strength a barbell can provide (though I still train with those too!). I’m also incredibly proud of how I look – my clothes fit better and I finally walk around with my head held high. Put simply: Training in this way changed my entire life. Here I am before and after I started my “superhero” training. That feeling of awkwardness from being the only person in my gym? It was replaced by another feeling I can’t get enough of: pride. Pride in training in a fun way while everybody else around me looked miserable. Pride when I finished a particular movement on the rings and had members come up to me and ask, “How do you do that? Were you a gymnast as a kid?” This happens at least twice a week now. As it turns out though, I’m not alone in my story. A few years back, Staci Ardison (from Team NF) was on a similar journey. As an overweight, pack-a-day smoker, struggling constantly with an eating disorder – the gym was the LAST place on Staci’s mind. For her, it was falling in love with barbell training and specialized bodyweight training with rings that helped her transform both physically and mentally. Staci is now a legitimate superhero, cranking out multiple muscle ups and deadlifting over 425 pounds. She credits this exact form of training with empowering her to overcome many hurdles in her life. Two different people. One guy. One gal. Separate cities, separate starting points, but both of us fell in love with a training style that allowed us to unleash our inner superhero. I imagine you might look at this page and WONDER if this is something for you. Maybe you feel like you’re not built like me or Staci. Can you really do something like this? But they’re wrong. And excuse me for saying this so bluntly, but: You’re wrong, too. Read on and you’ll see that me, Staci, and hundreds of other Nerd Fitness members don’t exercise like this BECAUSE we’re superheroes. Instead, we exercise like this precisely to BECOME superheroes! 1 — Gain complete control over your body and level up your fitness skills. Question: How much is your body capable of? Answer: A lot more than you realize! If you’re ready for a fun, new challenge, then learning how to gain control over how your body moves — especially once you start learning how to work with rings and practicing handstands is a great next step. 2 — Skip the gym and exercise at home (if you want). If you enjoy going to the gym, then practicing handstands and using rings will add a new twist your normal routine. I bring my rings to the gym. But if you HATE going to the gym, you can easily set up a pair of rings at your house (or in your yard, or at the local park). We’ll show you how to do this simply. Plus, you can practice bodyweight movements like handstands anywhere you’re comfortable and have a little room. 3 — Get motivated and have FUN while working out. Nothing is more boring than sitting on shiny machines at the gym, and nothing is more fun than hanging from a set of rings or balancing on your hands like a gosh-darned monkey. 4 — Build a body that looks better, feels better, and moves better than you ever imagined. We’re talking muscle, strength, fluid movement, flexibility, and control. Start to reverse years of sedentary or desk life and recapture what your body is meant to do: MOVE in fun ways! Imagine how good it’ll feel to have your body work for you instead of against you. 5 — Impress and amaze your friends. Imagine walking through a park, jumping up on the monkey bars, and flipping over them while your friends just gape and stare. Imagine how cool it’d feel to finish dinner, and then bust out a handstand in the middle of the living room. You may inspire your friends and family to try it too! Actually, maybe do the handstands before dinner. We don’t need you throwing up on the floor! 6 — Become part of a goofy and supportive community. We know how tough it can be to get in shape and stay motivated when you feel like you’re all alone. If your friends or family want to join you on your quest to get healthier, then cool! But if they don’t, no problem. Lots of people — including a huge chunk of the NF community — are training with rings and practicing handstands. Which means once you start practicing these movements, you’ll be in great company. In my experience, most people don’t know what they’re capable of. It’s sad because most of these people would be AMAZING at this style of exercise — if only they’d give it a try. They’d discover how fun, how motivating, how completely body-changing it is. Unfortunately, they fall victim to a few harmful and self-limiting myths. Yes, you most likely ARE in good enough shape! Look, if you’ve got over 100 pounds to lose, a better solution may be our Nerd Fitness Academy! If you are relatively comfortable doing basic bodyweight exercises like squats, push-ups (including knee push ups! ), or lunges, then you’re in good enough shape to level up and begin training like a superhero. Level 1 of this course starts fairly simple, so don’t rule yourself out without getting all the information. At Camp Nerd Fitness, we had multiple 50+ year-old men and women doing cool stuff like handstands and training with rings. She’s right: You CAN do this. All it takes is a little bravery on your part — we’ll take care of the rest and help you along the way! First, take a look at the photo above. Two out of the four people there are women. Look how badass they are! Also, think about this: Staci from NF is a huge rings and handstand convert — even though she couldn’t even lift a 10 pound dumbbell just a few years ago! Now she’s capable of some truly amazing things, and her body has changed forever. Look, it really doesn’t matter if you’re male or female, Gungan or Wookiee: Don’t let this dictate what you’re capable of. ALL sizes, shapes, and genders can do this — you just have to start at the level that’s right for you (and that’s exactly what we help you do!). That’s fantastic! If you have a core training program you’re following that’s working and getting results, then you definitely don’t want to REPLACE it. Instead, you COMPLEMENT it with new movements that will help you get better results even faster. Think of it this way: You can easily add a new movement or two to the beginning or end of your current workout. Or you could just as easily make this style of superhero training your sole form of exercise! Imagine how GOOD it will feel to make faster progress, get better results, and gain complete control over your body — simply by adding a few new, easy to learn superhero moves. I know how you’re feeling because Staci and I were once in the exact same place. The truth is, you CAN learn to do this. You may just be feeling a little nervous. If so, that’s OK. When I first started, Jim and my other coach Anthony gave me a step-by-step system. They walked me through everything and made it way less scary. That’s exactly what we’re gonna do for you! You CAN do this — you just need to follow a fun, easy-to-learn system. Here’s what’s waiting for you in NF Rings and Handstands. 80+ HD individual video demonstrations: We’ll guide you through an effective and fun exercise system using rings and your own bodyweight — starting with VERY basic exercises that anyone can do — and help you progress to some amazing new moves! You’ll never question what something should look like or feel like. Professional goofball guidance: Jim (aka Master of the Fitness Universe) and I walk you through a step-by-step system for building muscle, increasing strength, and losing fat — using only your bodyweight. Jim has 15+ years of experience learning and teaching this stuff. You’ll learn from the real deal. Private, members-only Facebook group: The Nerd Fitness Rebellion rocks. Our community members are some of the most passionate, generous, and motivating people you’ll ever meet. Getting healthy and leveling up your life can at times be a little lonely – but it doesn’t need to be. That’s why you also get access to a special, private “bodyweight training” group where you can ask questions of other jedi-assassin-ninjas in training. Many members actually claim this private community is worth the price of admission alone! So, that’s all the cool stuff you get. But what will NF Rings and Handstands help you do? Skip the gym and work out anywhere you want. Exercise at home, in the park, or wherever you’re comfortable. The gym is nice…but not necessary! Level up your fitness skills, no matter where you’re starting from: It doesn’t matter if you’re Harry or Hagrid, Black Widow or Brienne of Tarth: the skills we’ll teach you know no bounds, gender, size, age, or royal bloodlines. Get complete control over how your body moves: Strong like a gymnast; skillful like a Jedi; powerful beyond all measure. Plus, all your new muscles will be fun to look at in the mirror. Surprise the heck out of yourself: We’ll start you off with the basic movements that then progress into some pretty sweet moves as you gain more strength and confidence! Eventually, you’ll learn to do things with your body that you never thought possible. Yes, even that. But no, not that other thing you’re thinking. Gross. Inspire (and slightly confuse) your family: Them: “Wow, you look incredible! All that time in the gym is really paying off!”… “Actually, I don’t go to the gym that often.”… “I command you to tell me your secret”… “BOW DOWN BEFORE YOUR NEW JEDI MASTER”. Extra points if they actually bow down. Bottom Line: We know what we’re doing. We have a thriving, passionate community of nerds on the same journey as you. And our systems get results. We want you to join us today in this new way of training your body – because we want YOU to see the same sort of long-term success and results! Who is NF RINGS AND HANDSTANDS SUPERPACK for?? It’s for people – regardless of gender or starting point – who are interested in gaining complete control over the way their body moves and getting in the best shape of their life. We’ll take you through a fun, easy-to-follow process to help you build strength (and confidence) using rings and your own bodyweight — whether you train in a gym or at home in your living room. Rings? Handstands? Those things seem too advanced for me! I hear you, but I don’t believe you. 🙂 We’re big fans of using “20 seconds of courage” at Nerd Fitness. That means forcing ourselves to become comfortable with being uncomfortable! Just like stepping slightly outside of our comfort zone is where growth happens, often it’s discovering a new workout that pushes us to grow in new ways. We’ve designed this course to start you with the BASICS and only level you up after you’ve made specific progress. Let this be your journey to a body you’re proud of and put a big smile on your face as you learn some skills you never thought you’d try! Heck no! Although we personally love the gym (I bring my gymnastic rings and hang them up in my gym every day), we know that most people have busy lives, and many of you don’t have gym memberships. We’ve designed this course to NOT require any gym membership, though you’ll need enough space in your home (or in a nearby park or your backyard). You’ll also need a place to hang your rings! See the next part! For starters, you’ll need your bodyweight. If you don’t have that, then you can teach us how to disapparate. Otherwise, for the handstands portion, you’ll need a wall to practice against. For the rings course, you’ll need a set of gymnastic rings (which you can order from Amazon for as low as $30). You’ll need something to hang them from, which can be a door frame pull up bar, a beam in your garage, a swingset, tree branch, or the pull up bar at your local gym! In the course we will give you EXACT links for what you will need – with multiple budget options. We’ll also give you exact instruction on HOW and WHERE you can hang your rings (with several creative ideas), so don’t worry. I’m nervous about hurting myself. Is training this way safe? Provided you follow instructions and are honest with yourself, YES. The first rule of fitness is “do no harm!” This course has skill progressions created by Jim Bathurst, a trained professional with 15+ years of gymnastics and in-person training experience. Jim has been our head trainer at Camp NF and knows exactly how to teach these skills safely and in a fun, enjoyable way. What if I’m a complete and total beginner? We start every skill at the most basic level, so feel free to check out the course and decide if you want to give it a chance. But if you’re feeling like you’re really just starting and haven’t done any kind of exercise in a while, you might be better suited for The Nerd Fitness Academy; it walks you through the first 6-12 months of your fitness journey. What if I’m really overweight? We all start somewhere, right? Welcome! Now, this might not be the course for you, but we’ve got you covered. Check out the Nerd Fitness Academy, our flagship course that walks you through the first 6-12 months of your fitness journey. You can come back to this course once you’ve built a solid foundation! I’m in the Nerd Fitness Academy. Do I need this? That’s totally up to you! We like to think of this as extended skill trees for people who want to level up their fitness and gain complete control over how their body moves. (And, of course, get into amazing shape in the process.) Whether you already train in a gym with barbells and simply want to mix in some bodyweight training and rings — or if you JUST want to do bodyweight training — this course will walk you through the process, step by step. Can’t I learn handstands and muscle ups on my own? Of course! Now, the skills taught here are very challenging, and I would suggest making sure you are progressing at the right speed with the right progressions so you see progress and don’t hurt yourself! You see, Jim is a self-taught gymnast who taught himself all of these skills over 15+ years; he made all the mistakes, and we designed this course to keep you safe and help you bypass a decade of mistakes yourself, haha! That’s why we made this course. We want to take you through an easy-to-follow system that will teach you EXACTLY what to start with, when to progress, and how to do it all safely. We also believe the power of community and accountability will increase your odds of success. That’s why we include access to a private Facebook group just for the people who join. It’s motivation, community, and accountability all in once place. What if I’m more advanced? Although we start with the basics, you’ll start at your skill level and rank up all the way to an elite level. So let me answer your question with a question: Are you up for the challenge? Are you willing to put in the work? If so, we’re going to teach you some crazy-cool things. In fact, I’ve been training some of these moves for years and I still needed Jim to demonstrate the highest level moves because I can’t do them yet. Who’s this “Jim” guy, anyway? 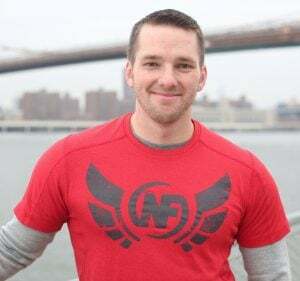 Jim is the new “Master of the Training Universe” for Nerd Fitness, having previously been CrossFit Director for CrossFit Foggy Bottom for a number of years (where it won Best CrossFit Gym in Washington DC). Before that, he was an award-winning, full time Personal Trainer and founded a website with popular tutorials for advanced bodyweight skills. Through his work online and off, he became frequently requested for seminars both here in the USA and abroad. He’s also a HUGE nerd, so it’s a perfect fit! I’m a busy parent with kids. What kind of time commitment are we looking at here? We hear you. You gotta take care of those kids! You also gotta be a superhero role model for them. And what better way to set a good example than to teach them that exercise can be enjoyable with fun things like handstands and swinging from rings? These are skills you can work on for just a few minutes at the beginning of each workout, mix more into a full workout, or for just a few minutes each morning before the kids wake up. This course is designed with the busy person in mind. How does NF RINGS AND HANDSTANDS SUPERPACK work? Once you purchase this course you’ll plug a USB cord directly into the back of your head and you’ll acquire all skills within 2-3 minutes. If you don’t have a USB port in your head, then you’ll have to do it the old fashioned way! We start you off slow with each skill, teaching you the basics, then walking you through a proprietary skill-tree system, step-by-step until you’re doing some awesome movements. This system teaches you EXACTLY when to progress as you get stronger! How long will NF RINGS AND HANDSTANDS SUPERPACK take to do? We’ve structured this course like a choose-your-own adventure. If you only have a few minutes each morning, then you can pick which skills you want to focus on. If you want to work one or more of these skills into your workouts, then you can do that too! We tell you what to do, when to do it, and for how long! As for how soon till you’ll be doing full-on handstands and muscle ups, that’s up to your current level of fitness and how serious you are about training. What if I try NF RINGS AND HANDSTANDS SUPERPACK and realize it’s not for me? We get it! We want you to feel great about this purchase, and we want it to get results for you. So try it risk-free for two months (60 days); if you haven’t made meaningful progress on your bodyweight skills nor seen your physique change, shoot us an email and we’ll refund 100% of your money, no questions asked! We want to get you in the best shape of your life, and hope we’re the ones to get you there! Can you teach me how to teleport? We haven’t quite perfected teleportation…yet. Let’s get you started with handstands and muscle ups, and then we can move onto levitation, teleportation, and telepathy. I actually just sent you a message through the ether with my brain. Did you get it? — and what will it be able to do? Bodyweight training — especially learning how to use rings and practice handstands — completely transformed my body and Staci’s. Not only the way I looked, but also how I felt and how I moved. Using bodyweight to train has helped thousands of other NF rebels get in amazing shape — and it can do the same for you. How cool would it be to have complete control and mastery over your body? To be strong like a gymnast and skillful like a Jedi? How good would you feel knowing that your training was helping you build a resilient body — while burning fat and gaining muscle? How amazing would it feel to know that your dedication to exercising in a fun way was directly inspiring your friends and family to get in better shape too? With NF RINGS AND HANDSTANDS SUPERPACK, we’ll meet you exactly where you’re at — whether you’re a complete beginner and afraid to try your first handstand, or a super-advanced fancy person — and show you how to build muscle, gain strength, lose weight, and move your body in ways you never thought possible. Training with a system like this has been one of the greatest surprises I’ve had with for MY personal physique, strength, and happiness. I want the same for you. I’m confident that if you follow the step-by-step process in these two courses, you WILL level up your life…permanently! However, I know this is an investment and I want to prove to you that it’ll change how you look, and more importantly, how you feel. So give me 60 days, risk-free. If for any reason you decide that NF Rings and Handstands isn’t for you, just let us know within 60 days, and we’ll give you a 100% refund. No hoops to jump through. No questions asked. No sneaky tricks. We’re in this to work WITH you to change your life for the long-term, and I want you to feel good about taking a chance on this course. BOTH courses for one price! Save 20%! Only want one of these courses? Ever since Staci and I transformed our bodies, I’ve dreamed of being able to share these superhero-making moves with you in a fun, easy-to-learn system. Now that it’s finally here I couldn’t be more proud of it. Remember: You CAN do this. You CAN gain complete control over your body, learn how to perform like a gymnast, and get in amazing superhero shape. All you have to do is take the first step. We’ll take care of the rest. If for any reason, this training package doesn’t work out for you, just let us know in the next 60 days. We’ll get you fully refunded. No hoops to jump through or questions asked. PS: I typed half of this page while hanging from rings, and the other half while upside down in a handstand. PPS: Okay not really, but that would have been pretty impressive, right?